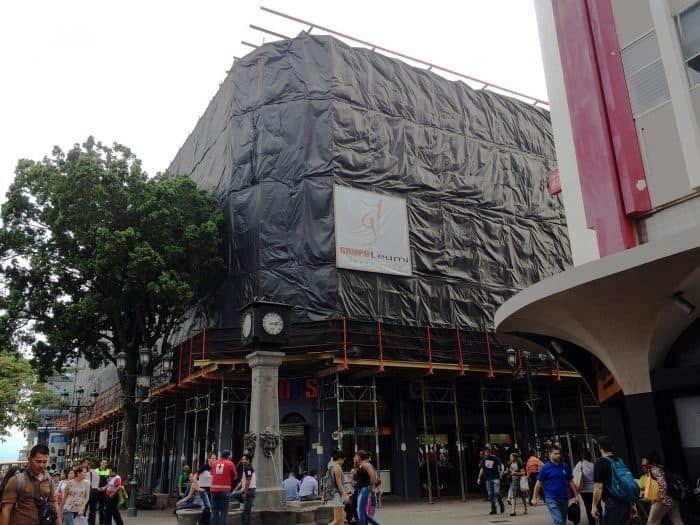 The ongoing renovation of the Gran Hotel Costa Rica, one of the most iconic buildings in downtown San José, has elicite outrage from citizens, architects, and others who claim the new design will strip the building of the characteristics that earned it a declaration of Historical and Architectural Heritage by the Culture Ministry. Renovation work on the hotel, inaugurated in 1930 in front of the National Theater, began in June and are expected to be completed in December. The investor group Elite Hotels and Resorts Costa Rica signed a Hilton Worldwide franchise to operate the hotel under its Curio Collection by Hilton brand. 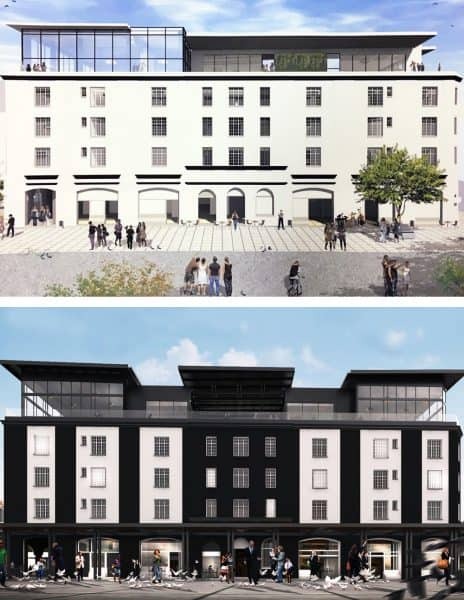 On Sunday, the daily La Nación published an detailed story about the changes being made, including renderings of the expected results provided by construction company OBP Arquitectos. 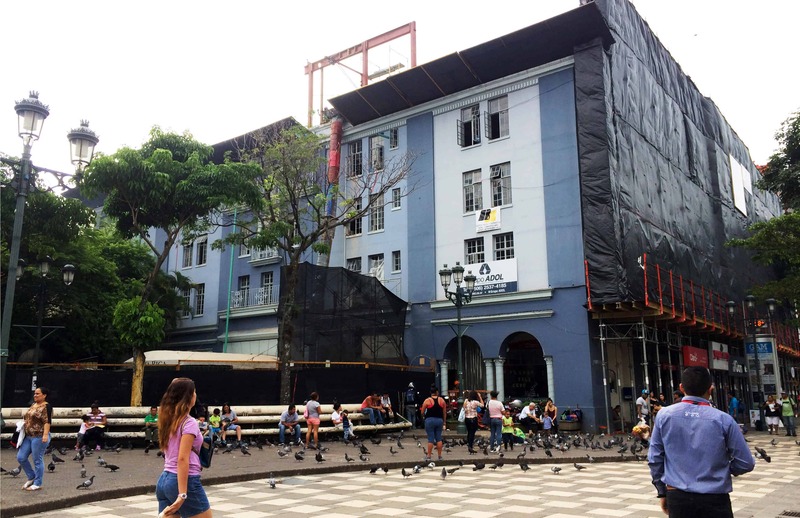 The images show a total transformation of the building façade, which provoked severe criticism of the firm and of the Culture Ministry’s Heritage Conservation Center, responsible for granting the work permit. Op-Eds, letters and messages on social media from citizens and groups have since criticized the design. Former President Laura Chinchilla who described it as an eyesore on her Facebook page. 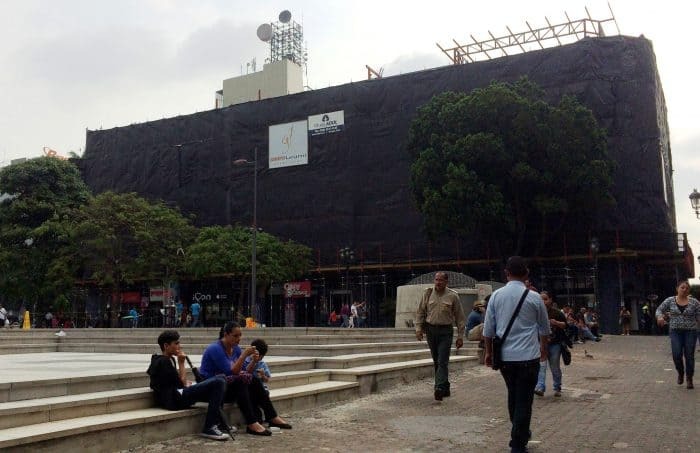 Culture Ministry and Heritage Conservation Center officials met with members of the Federated Association of Engineers and Architects (CFIA) on Wednesday to discuss the situation, prompted mostly by public backlash against the project. 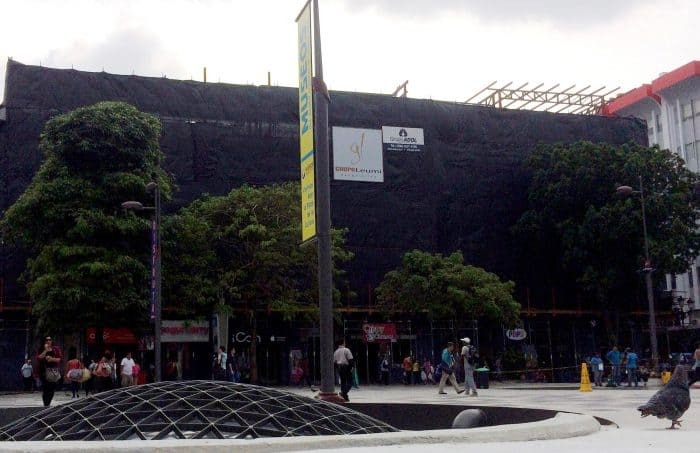 The statement denied that the colors will be black and white, as shown in the La Nación story. The ministry also provided renders of the approved plans, and noted that officials from the Heritage Conservation Center are supervising the work and conducting weekly inspections. The ministry said that the hotel’s arcades, one of its most popular features, will not undergo any modifications. According to Heritage Conservation Center research, the fifth floor was built years later and has already been replaced and rebuilt several times. CFIA members agreed to appoint a group of additional experts who will join Heritage Conservation Center officials on their inspections in coming days. 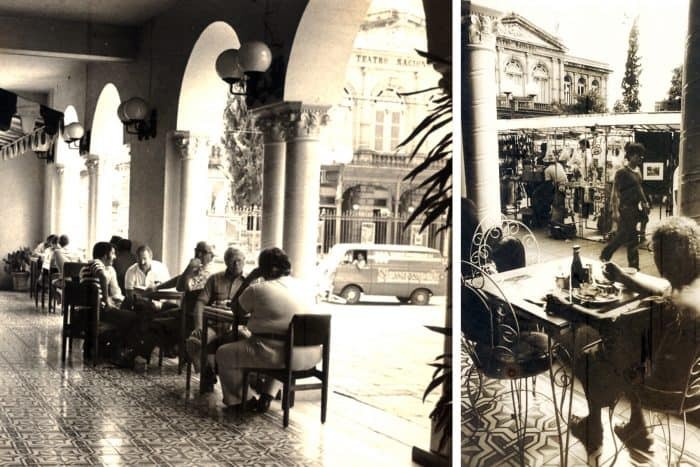 The Gran Hotel Costa Rica was inaugurated in October 1930, with U.S. architect Victor Lorenz in charge of the project. Besides its architectural heritage, the hotel’s suites hosted several important visitors including U.S. Presidents John F. Kennedy, Harry Truman and Jimmy Carter. U.S. actor John Wayne, Mexican comedian Mario Moreno “Cantinflas”, Panamanian boxing champion Roberto “Mano de Piedra” Durán, and Brazilian football legend Pelé have also spent the night there. For those historical reasons, the Heritage Conservation Center permit demands building owners’ strict compliance with a series of requirements to maintain the hotel’s original design. 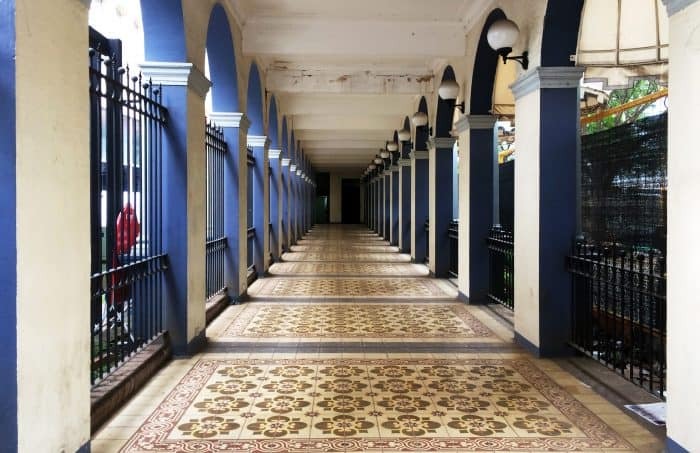 These include recovering the original texture of the terrace floors — currently covered by lower-quality flooring — and keeping all original floors and mosaics in the building, except for carpets. The room used by President Kennedy must be preserved, maintaining all windows and their original closing mechanisms, as well as the arcades as they exist today at the hotel’s entrance.